A five-time Grammy winner; hailed as a musical genius; her latest album, Back to Black has made the U.K.’s Top 10 List of best-selling albums of the 21st century—it is no wonder why a band would want to emulate the unique style and unforgettable voice of the incomparable Amy Winehouse. Out of love and respect for such a profound artist, Dana DeLorenzo wanted to do just that. After months of studying Winehouse’s voice, speech, and body language (and adding the cat-eyes, tattoos, and now-famous beehive) the transformation began. The final addition was a powerful six-piece band — and together, they conjure the spirit and extraordinary sound that has made Winehouse a stand-out artist. Amy Winehouse’s music is unparalleled—-from her contralto, brassy voice to her autobiographical and penetrating lyrics—she is one of a kind. 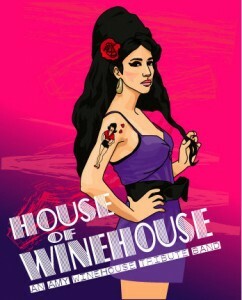 But it is the hope of House of Winehouse to provide a sample of her soulful music and hip-swaying beats to those who are unfamiliar. And to those who are fans of the British sensation, to share in the love of her art. Whether it’s the music or the banter in between, House of Winehouse is true entertainment that appeals to a wide variety of audiences and demographics alike. 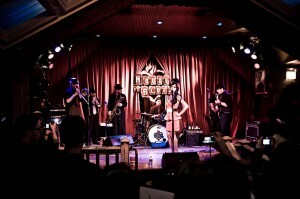 Excellent website and as well as excellent band……….we heard them during our first trip to Chicago and they were great. Not a weak link in the bunch……….”Amy” is very relaxed in her role as Amy because she knows she is backed up by some of Chicago’s Best Musicians. Good Luck and Keep At It. Nice Cousin, Christy wants me to bring her to the windy to see your show! Take care! We love the new website – can’t wait for your next show – she you on the 26th!! We’ll come see you guys at the House of Blues and bring at lease a few friends. I’m listening to Dana right now! Outside my window at the Belmont-Sheffield Music Festival… I thought it WAS Amy Winehouse! Great show! We saw you at Pridefest yesterday in Milwaukee. You were awesome! Dana was hilarious! Hey you were great in Milwaukee loved the show and the picture ur a sweetheart. We would like to express our utmost sympathy to the family, friends, and fans of Amy Winehouse. We are grieving with all of you. It is a tragic loss of a musical legend. We have been paying homage to Amy since 2008. Her voice, music, and soul took us to another place, as it did for all who loved her. We are indebted to her for giving us a platform to share her music with fellow fans. It is our hope that through her music, her fans, and all who pay tribute to her, that we may keep her spirit alive. THE READER'S BEST TRIBUTE BAND 2010!